Many people spend somewhere between a third and half their adult lives at work. But it’s usually one of the last places people think of when it comes to health and wellness. I mean, if you’re at work you’re supposed to be working, right? But, what if you have neck pain, wrist pain or low back pain? What if you feel sluggish between 2 and 4 o’clock in the afternoon? How much work can you get done if your focus is split? If you’re like many people, you lose productivity, have lower morale and your work experience is something you dread rather than look forward to because you don’t take the time to ‘sharpen your saw’ so to speak. That’s where we can help. We come to your office to help you implement easy, effective and straightforward health and wellness programs. Get in touch with us if you would like more information about any of our services or our pricing structure. Our Lunch and learn sessions (30 to 45 minutes) are a cost effective way for you to get the ball rolling. These are group presentations usually done on one of the following topics. Neck, shoulder, wrist and low back pain are the most common injuries or conditions that you’ll have to deal with at work. In fact they will affect almost everyone at some point in their lives. Doing stretches and massage therapy can help, but if you don’t fix the problem causing the underlying issue then your pain will keep coming back. We can look at how your workstation is set up and make simple and easy adjustments that can help alleviate many of these problems. Then we supplement these adjustments with stretches, exercises and changes to your workflow that will minimize these ailments from returning . 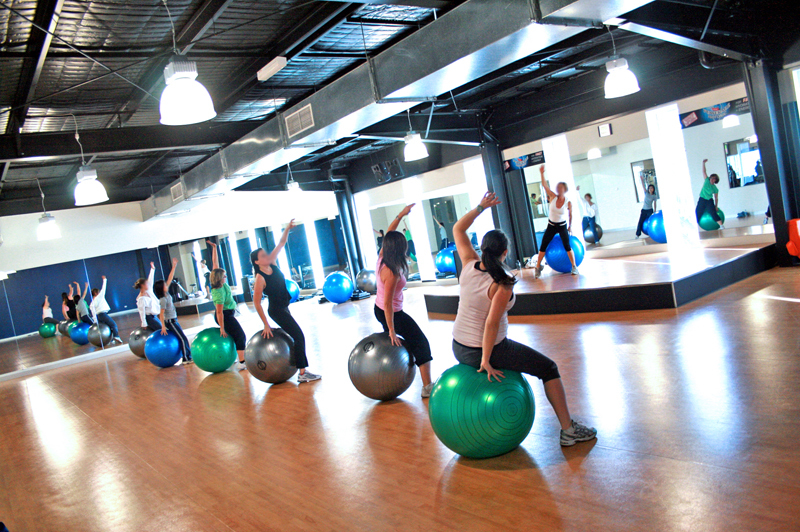 A group fitness class can be a great way to spend your lunch hour. You’re exercising which means you’ll eat less food, you get your heart rate up which will keep you energized for your afternoon and you’ll build your muscles making you stronger, improving your posture and making everything else you do in your everyday life that much easier. We can work with 1 to 12 people at a time. Yoga can be a very effective way for you to improve both physically, think mobility and strength and mentally, think stress relief and focus. The workplace can feel hectic and overwhelming. Taking 45 minutes over your lunch hour to move your body, decrease your stress and reset yourself, can help you be more productive and focussed for the rest of your work day. Bringing a few co-workers along can make it a shared experience and more affordable for everyone. Headaches, neck pain, shoulder pain, low back pain; we could probably go down your whole body and find a joint or area that is sore. If it’s muscle then massage therapy will always help, if it’s in the joint, massaging the muscles around the joint often helps alleviate the pain. This is especially effective when combined with an ergonomic assessment and/or a few targeted exercises. Massage Therapy sessions are 15, 30 or 60 minutes, to fit the time you have available at work.